As i was getting up i must have disturbed my wife , who quickly decided to join me, so we both got up and sorted out, quick coffee before loading the car for a short drive to Viking Bay Broadstairs. When we arrived it quickly became apparent that there was a lot of cloud and we were going to be extremely lucky to get a good sunrise. With that in mind i decided i was going for a longish exposure to blur the incoming waves. I Found a composition i liked and set about taking images and trying to time it right with the waves on the retreat to get the white trails as it retreats back. The above image was at ISO 100 F/22 for 13 seconds. I tweaked the white balance to get a softer feel to the image. I took a few images at this spot and processed them all slightly different to see what a difference processing makes to a image and converted one to black and white. Not the best sunrise but still a nice thing to do, just not to often ! 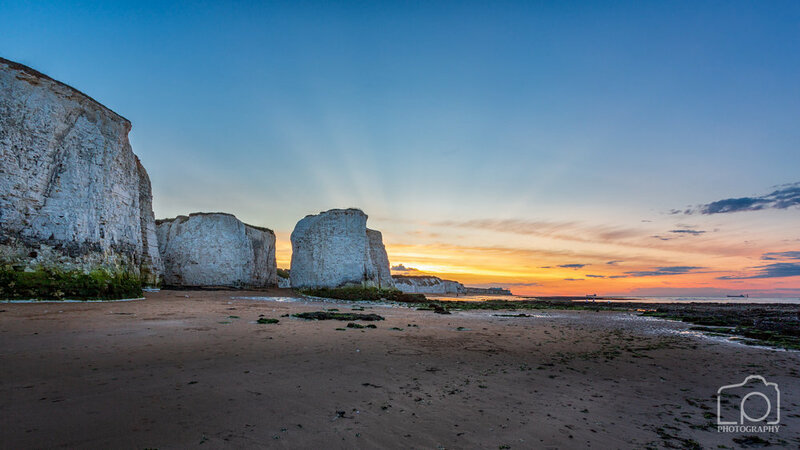 Took a drive down to Botany Bay in Broadstairs tonight to try and capture a sunset. The last few nights seem to have been really nice so i grabbed my gear and jumped in the car. Well first off should have checked the tide times as the tide was coming in fairly quick, so the idea of a sunset with the chalk stack in the foreground was a little out of the question as i would need to be a fair way out to sea buy now and i was only wearing trainers ! Luckily i had arrived a little early so i had time to try a few compositions to try and find the right spot. I managed to find a location between the stack and the cliff with the tide coming in and the sun setting in the background. Sadly it was not the sunset i hoped for but i tried to make the best of a bad situation and at least get a nice image. Took a drive out to Reculver tonight to see the sunset and to take some images, what i should have taken was a pair of wellies ! I like the fact that the car park there is free after 18:00 hrs , this time of year its perfect for us photographers to get there in plenty of time for sunset. I made my way up the slope past the towers and down the other side where i made my way down onto the beach. I made my way along the top of the shingle and could see some water coming from somewhere, so i made my way down to investigate. I have never noticed this water outlet before , situated at one end of one of the rock water breaker. Before i knew it , i was walking or wading through small pools of sandy water and my jeans were getting soaked. When i was getting ready to leave i bumped into another couple of photographers who were a little more prepared than i as they had wellington boots on !! Oh by the way if that was you, Sorry, i was not ignoring you i just had my ear phones in so couldn't hear you !! For this image i think it was a three stop solid ND filter i used , just to help smooth out the water slightly not the greatest sunset but i just had to get my gear out, not been out for a while so it was good to get out this evening.